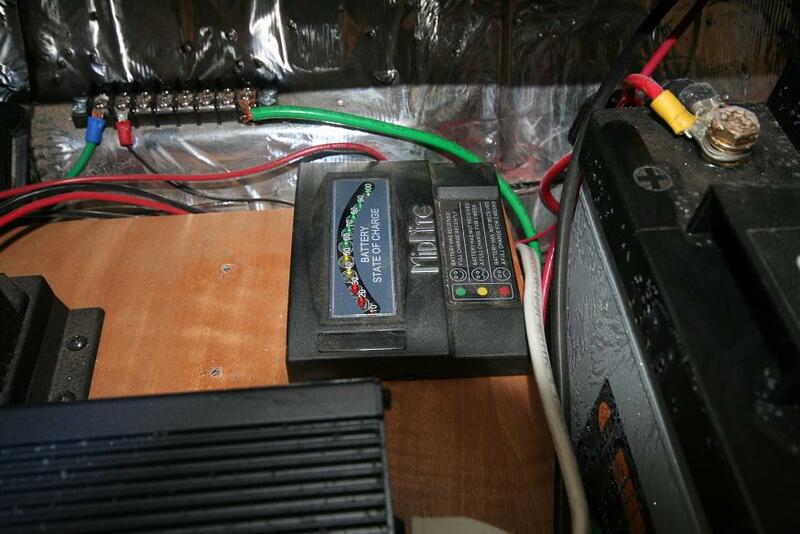 We wanted to build a renewable energy system that would allow the use of AC and DC appliances. Fortunately I had some experience with this kind of thing, as I worked in the renewable energy industry for several years. I decided to use solar, and wanted to have enough stored energy to last a day or more without any sun or driving to recharge the battery. I also needed a solar panel that would fit on top of the van while still allowing enough space for the surf boards. I ultimately decided on this little ditty for its size, power, and shear beauty. 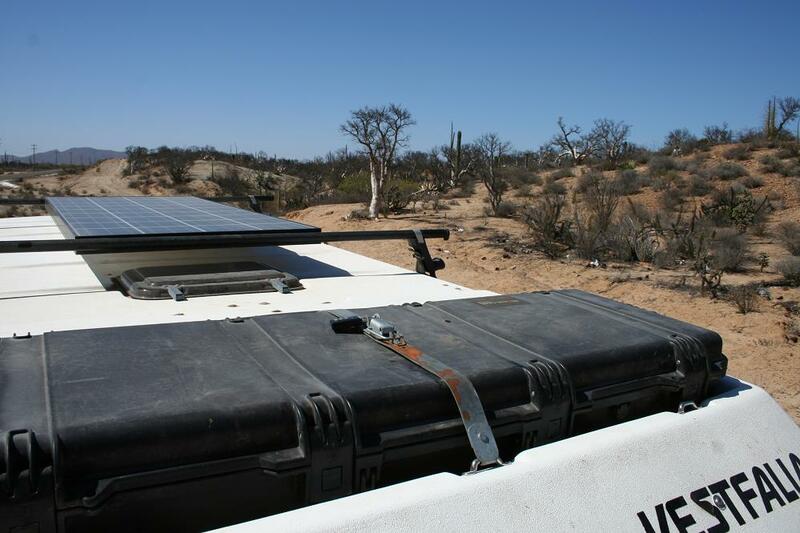 This picture shows our solar panel in use on our Baja test trip, prior to installing the surf board rack. 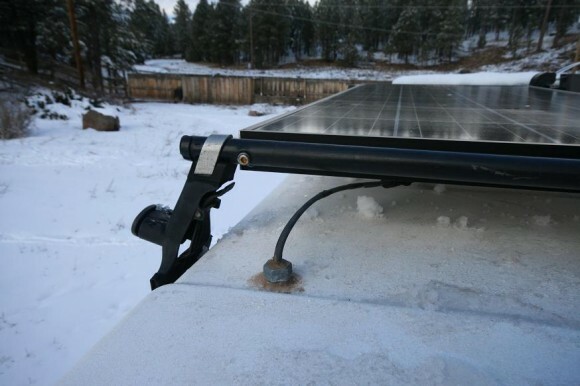 The solar panel’s job is to convert the sun’s energy into electrical current, and then pass it down the line. I ran the wiring from the panel through the pop top shell, along the inside edge of the headliner, through a special tube that Sheena sewed in the Gore-Tex tent, through the bed platform, down the wall, behind the counter, and under the seat. 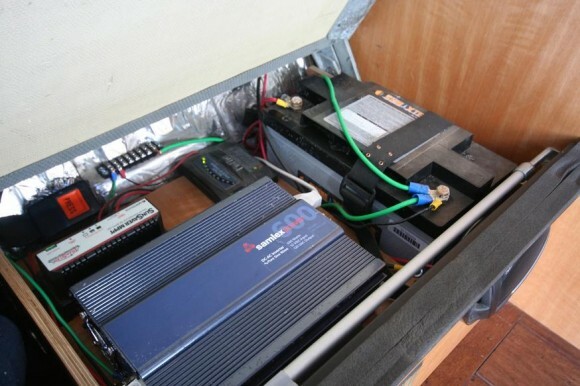 After that nightmare of a wiring job, it finally reached the auxiliary battery compartment that we made under the seat. Due to the fact that the battery would be powering all of our electrical amenities for the foreseeable future, the battery was not to be skimped on. Being that marine batteries and golf cart batteries are for mere child’s play, I opted for a truly legit renewable energy battery. Why not use a regular car battery, or some other cheaper option? Because you don’t bring a knife to a gunfight and you don’t use a screwdriver to beat an egg. Based on some calculations, I settled on this battery with 104 amp-hours capacity. Our experience thus far has shown this to be a great choice. Hooray for avoiding an expensive mistake! Of course, one can’t simply plug a solar panel into a battery and expect not to experience a fiery death. To avoid this fate, we needed a charge controller. Given that we were limited to a certain size of solar panel and battery, we were able to increase our energy generation by choosing a MPPT (maximum power point tracking) charge controller (this little guy). What does this mean? Basically it uses more complex algorithms to maximize charging efficiency. It’s like increasing the size of the solar panel by around 20% without actually increasing the size of anything. Click here to get the nerdy details. The last item we added was a battery charge meter. This is a simple component that measures the battery’s voltage and converts it to an easy-to-read value between 0% and 100%, telling how full the renewable energy battery is. It’s a bad idea to discharge a deep cycle battery more than about 50% on a regular basis, so we keep an eye on this meter and reduce our loads when we start to dip down that low. There are a few package solar kits out there, but in my opinion they’re not the way to go. The price of solar has dropped by two thirds since 2008, but the price of these kits remains constant. Furthermore, you don’t get to choose your own components. As a result, we put together our 135 Watt solar system (more like 160 Watt with the MPPT controller) for less than the cost of a 50 Watt kit from a certain major online Vanagon parts company. Better to educate yourself and DIY. 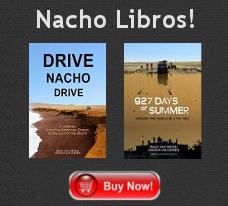 The following banner ad features Sheena and Nacho on Southwest Windpower’s website. Of course, this is a wind turbine, but it’s electricity nonetheless.